Before the samurai, before geisha, before kimonos or bushido, there was a golden age of Japanese civilization. This period produced the finest literature in the history of Japan, and some would argue, the finest literature in the history of the world. This was the Heian period, an era spanning the years 784–1185 A.D. The thing that makes the Heian period particularly significant is that most of the really noteworthy literature, particularly Genji Monogatari, known as The Tale of Genji in English, was written by women. In Heian Japan, the government was controlled by a hereditary bureaucracy located in the capital of Heian-Kyou (which gives the era its name), the city later renamed Kyoto. The bureaucracy was their aristocracy. It was a small, insular community estimated to comprise no more than 10,000 people, almost all of whom lived in or around the capital. To their minds, nothing outside the capital was important. Indeed, for hundreds of years, exile to the provinces was considered terrible punishment for a crime. Some preferred execution to having to leave the capital. Their relentless parochialism led to such neglect of the governance of the areas of the country outside the capital that local warriors eventually rose up and displaced them as the masters of the country, leading to the government of the samurai more familiar to most of us. Heian Japan was a polygamous society. The number of wives a man could have was determined by his rank, in fact, practically everything was determined by rank. Concubines were limited by what he could afford. While there were laws on the books prohibiting women from engaging in adultery, people tended to look the other way if she was discreet. Aristocratic women in Heian Japan actually had many more rights and privileges than their daughters who lived under the later samurai governments. They had the right to own property, inherit in their own names, and to bequeath that property as they desired on their death. Furthermore, women were somewhat outside the extremely rigid rank structure that the men lived under so that a woman could sometimes marry up, gaining rank and status for her children. The opposite situation was extremely rare, where a man married a woman of a substantially higher social class. This opportunity for women to improve their social status culminated in the practice of “marriage politics” where families would groom their daughters to catch the eye of a highly-placed nobleman and hopefully induce him to make her a wife or concubine. The best way to provide that opportunity was to have a girl serve at the imperial court as a lady-in-waiting. The imperial households employed an enormous number of low-ranking noblewomen to wait on the imperial family, particularly the wives of the Emperor. The most powerful men in the nation, as well as countless lesser nobles looking to better themselves, congregated at the court. There was ample opportunity for a woman to meet and attract a suitable mate. The competition for the positions at court was intense, and the successful applicants usually had strong family backing, often relying on relatives highly placed in the government to push their names to the Emperor along with the beauty and accomplishments of the women themselves. Family connections were key to the advancement and success of a man. Without strong family support, careers languished and promotions were few and far between. Much of the support came from the mother’s and wife’s family. When a man got married, he would usually move into the house of his wife’s parents. He might rotate residency among the residences of his various wives, but his children lived with and were raised by their mother. This meant that the support of the mother’s family was of paramount importance in the success of the children. Unlike many societies, there was no real concept of “illegitimacy”–if a nobleman acknowledged a child, then it didn’t matter the circumstances of the child’s birth. All acknowledge children were generally treated equally. In noble households, higher-ranking wives would often adopt the children of lower-placed concubines in order to ensure proper education and familial backing for them. Relations between men and women were strictly regimented. When speaking with males other than her immediate family, a woman was expected to ensconce herself behind portable screens or curtains. In the romances of the times, a common trope is for a man to catch an unexpected glimpse of a woman’s arm or hair and become immediately entranced with her. Fashionable women wore layers and layers of clothes, chosen to showcase their good taste by the selection of colors. One estimate places the weight of full formal court robes at about forty pounds. Women mostly stayed indoors at their residences, only venturing out for pilgrimages to local temples and other religious purposes. We know a surprising amount about the life of upper-class women in the Heian era because the diaries that many of them kept, some of which have survived into the present day. One of the most compelling diaries of the time, Kagerou Nikki (translated as Gossamer Diary by Edward Seidensticker) tells the heartbreaking story of a woman afflicted by depression and bouts of self-loathing as she lays bare all the thoughts and angry feelings she harbored towards her wayward husband. She speaks freely of boredom and frustration of waiting in her house interacting only with family and servants. It was the only social contact she was allowed with the outside world other than writing letters and visiting Buddhist monasteries. The most exciting thing in her life was the visits from her husband. But he often sent word that he was going to come and then would fail to show up, something that frustrated her to no end. In the end, he stopped visiting and sending presents, the Heian equivalent of a divorce. I really can’t understand people who get angry when they hear gossip about others. How can you not discuss other people? Apart from your own concerns, what can be more beguiling to talk about and criticize than other people? But, sadly, it seems it’s wrong to discuss others, not to mention the fact that the person who’s talked about can get to hear of it and be outraged. A contemporary of Sei Shonagon was named Murasaki Shikibu. She also wrote a diary, but that is not what she is best known for. She was the author of Genji Monogatari, the world’s first novel. Murasaki seems to have been the first person in either Japan or the world to have the idea of telling a story, but doing so in a way that the action, the people, and the setting were all “realistic.” Her characters are finely drawn, with motivations and aspirations that are clear even to us peering back through the barrier of a completely different language, a thousand years, and an alien culture. From her we read the Heian ideal of a man, Prince Genji. He was handsome, clever, and sensitive. He excelled at the arts of calligraphy, perfume making, and poetry. He was so attractive few women denied him, and those that did, he generally took anyway. The book follows him through his many affairs. 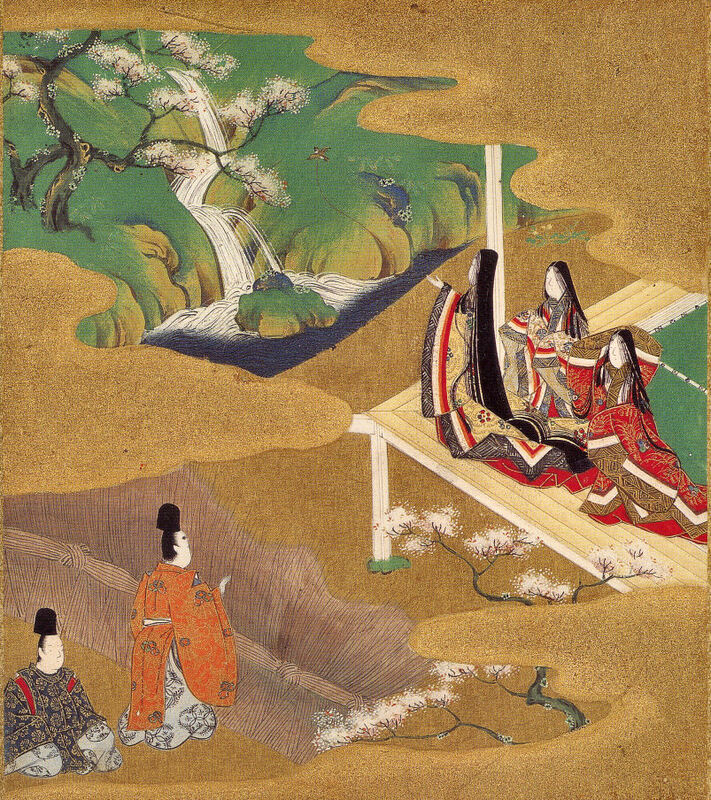 The women of Heian Japan left us a rich and enduring legacy of their thoughts, their feelings, and their lives through the medium of their writing, both autobiographical journals and diaries and fictional works such as Tosa Nikki and Genji Monogatari. It was a legacy that would rarely be equaled, and never surpassed, in the history of Japan.